Back last spring, Emily, a Hudson Falls resident and director of the Wood Theater in Glens Falls, came home from work to find the low drawer where she kept her breads had been opened. The Thomas’ English Muffins had been pulled out, the package ripped open and the breads eaten. Clearly, this was her dog at work. She’d had the rescue pit bull dog for about a year; they’d been through some anxiety issues but he was typically well behaved. But this happened often enough — drawer opened, Thomas’ eaten — Emily set up a GoPro camera and ran experiments. Murray saw her place the camera. It showed him looking back and forth between the drawer and the camera before sauntering away. Emily hid the camera in a different spot, and Murray clearly goes in, but only for the Thomas’ — other breads not disturbed. Even other brands of English muffins, untouched. Emily had never fed Murray English muffins. He was on a strict diet while recovering from heartworms. She put the videos up on Facebook. Then someone sent her news of the Thomas’ English Muffins contest, which posted on Facebook in September. There were hundreds of entries, but Murray was the only canine. He was named one of three finalists. With “thousands” of votes registered, Murray was “the clear winner,” the muffin maker told The Chronicle through a person at its marketing firm who declined to be identified for “contractual” reasons. Murray is a pit bull mix, a rescue dog adopted by Emily Murphy on April 29, 2017. Just over a month prior, he’d been dropped at a shelter in San Antonio, Texas, bloodied and broken, abandoned by the people who had used him as a bait dog, training other dogs for illegal fights. Too calm and docile to be a fighter, his snout had been taped closed so he couldn’t fight back. Then the trainers would let other dogs attack him to test their fighting instincts and abilities, Emily explains. She says the dog — then named Chester — was deposited at a high-kill shelter, not expected to survive. But he was treated by an emergency vet, then picked up by a New York group called Rescue Dogs Rock. 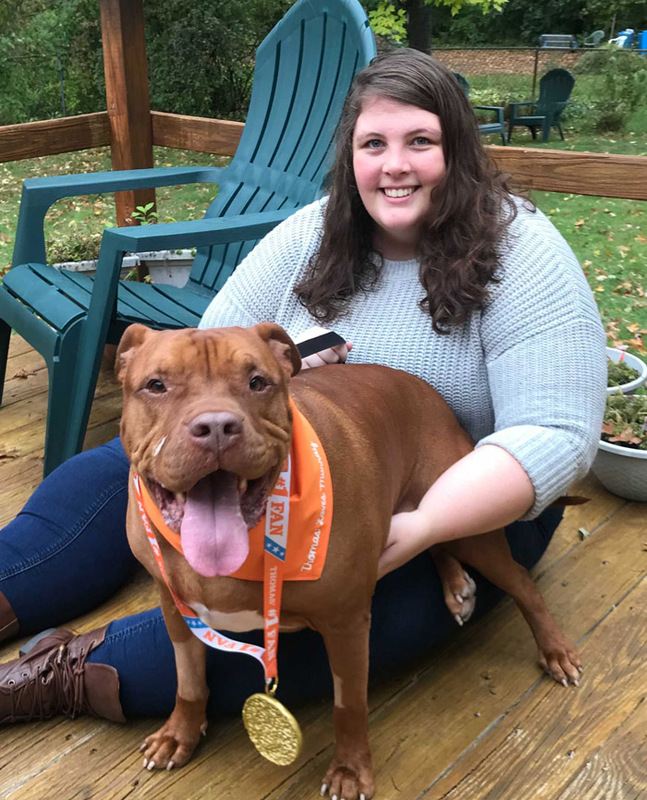 Glens Falls resident Bridget Dunigan took him in as a foster dog, renamed him — and then Murray met Emily. Emily says it wasn’t easy at first. Murray came to her “full of anxiety.” He’d chew his way out of his crate, until she secured it with several locks. He destroyed window screens, chewed his own tail bloody when secured in his crate, she recalls. Murray wins a 3-D golden “Thomas’ English Muffin” medallion, and English muffins for a year — a package a week. The additional prizes were geared toward a human: A toaster, a breakfast mug. The company added some “doggie” prizes for Murray, including a signature orange dog bandana that reads “Thomas’ loves Murray,” plus a bag of orange tennis balls and squeaky dog toys. What’s next for Murray and his English Muffins? Thomas’ said they’ll stay in touch. National English Muffin Day next April will mark the 139th anniversary of Mr. Thomas’ introduction of the bread in America.